In addition to taking home top honors for its Baseball cupped clad half dollar, the U.S. Mint’s Baseball gold $5 coin (KM# 578) was named “Best Gold Coin” in the Krause Coin of the Year for coins dated 2014. Both coins are part of the 2014 Baseball Hall of Fame commemorative coin series, in which the obverse is concave, and the reverse is convex. The National Baseball Hall of Fame Commemorative $5 gold, $1 silver, and one-half dollar clad coins were the first curved coins ever minted by the U.S. Mint. As highlighted by the Mint, the curved design was inspired by the Royal Australian Mint’s Southern Cross curved coins, as well as the French Mint’s convex/concave 2009 International Year of Astronomy Coins. was designed by Cassie Mcfarland. Her design was selected from the finalists by the Department of the Treasury on September 4, 2013, after consultation with the National Baseball Hall of Fame and U.S. Commission of Fine Arts and review by the Citizens Coinage Advisory Committee. As described by the Mint, the common obverse design “depicts a glove that, combined with the baseball design featured on the reverse, exemplifies the most basic elements of our national pastime or a simple game of catch in the backyard or at the local sandlot.” The glove design also serves to highlight the innovative shape of the coin. The obverse features the following inscriptions: LIBERTY; IN GOD WE TRUST; and 2014. The common reverse design depicts a baseball similar to those used in Major League Baseball®. It includes the inscriptions: UNITED STATES OF AMERICA; E PLURIBUS UNUM; and FIVE DOLLARS. Don Everhart served as the Sculptor-Engraver for the obverse and reverse. The coins were struck at the West Point Mint Facility. It was one of the more popular United States Commemorative coins and it sold well. 17,674 coins were minted in uncirculated and 32,428 were minted in proof. 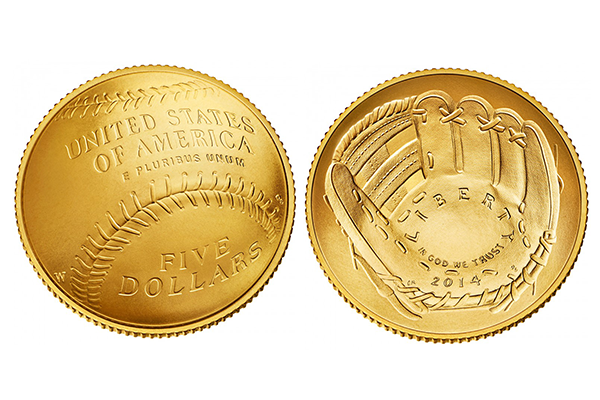 The National Baseball Hall of Fame $5 Gold Commemorative Coin is composed of 90 percent gold and 10 percent alloy. The diameter of the gold coin is 21.59 mm, and it weighs 8.359 grams.